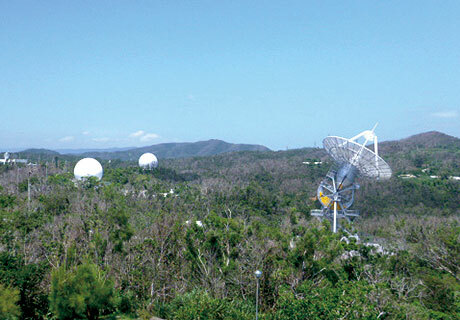 The Okinawa Tracking and Communications Station was established in February 1968 as the Okinawa Radiowave Tracking Base of the then Science and Technology Agency (STA) Space Development Headquarters, which was affiliated with the then National Space Development Agency (NASDA) as its facility when NASDA was established in October 1969. 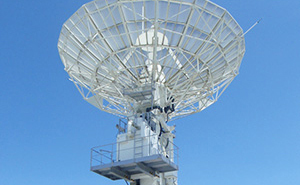 At the station, we have two sets of tracking and control systems with parabolic antennas measuring 18 meters and 10 meters in diameter. In addition, there are the WINDS beacon station and a parabolic antenna with a diameter of 30 meters for visitors to look at. Two more tracking and control stations with a 7.6-meter parabolic antenna (covered by a raydome) were newly constructed. You can look around the Okinawa Tracking and Communications Station freely. The station is equipped with a parabolic antenna measuring 30 meters in diameter for visitors to look at, the first exhibit hall, which explains the roles of satellites, the third exhibit hall with an engineering model of a broadcasting satellite (BS), the Space Information Room, where you can learn about space related issues, a Video Room and Environment Corner. * Due to parking space constraints, please do not come to the station in a large-size bus. Baby strollers and wheel chairs can also enter the facility. No pets are allowed to enter the facility except a seeing-eye dog or a service dog. 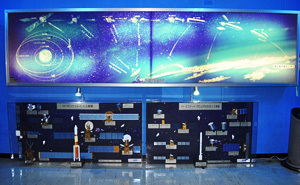 At the Exhibition Hall, you can enjoy some explanatory models on the types and roles of satellites and launch vehicles, and an actual test model made during the development of the broadcasting satellite (BS) “Yuri." which was manufactured during its development. 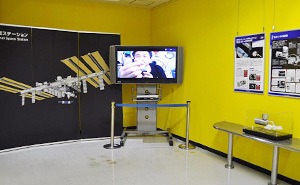 In the Video Room, you can watch videos and anime of rocket launches and space development. 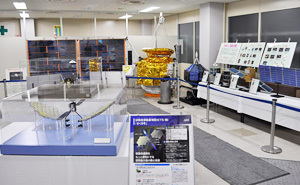 We also have the “Space Information Room,” where you can learn about space development in a fun manner by reading some space- and environment-related books and enjoying the Internet and a space-related quiz through personal computers.